I have been excited to share these for awhile and hope that you all like them as much as I do. 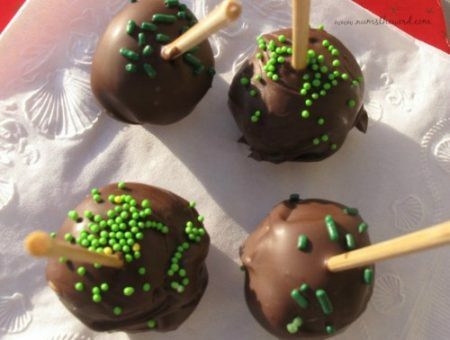 I had seen a recipe for Key Lime Pie Truffles, but when I went to the recipe, it involved cake mix and lime-flavored frosting. There is nothing wrong with those two things, and actually they are probably quite tasty. But I wanted something that tasted like key lime pie dipped in chocolate. Like my friend Sarah had made with Pecan Pie. I looked and looked, and could not find anything that fit what I had built up in my mind. So there was nothing else to do but make it up myself. And that’s just what I did. It took a little tweaking, but oh my! They turned out fantastic! 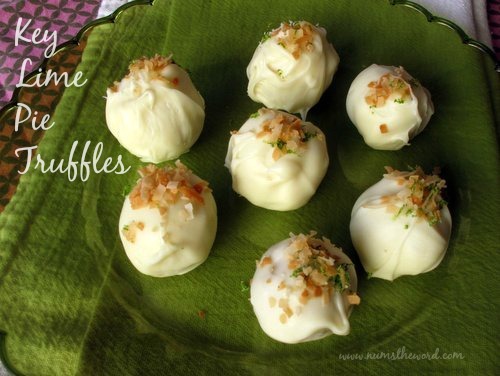 And seriously, if you like key lime, you should try these. Because they’re awesome! To soften cream cheese, remove from wrapper and place in a medium size microwave safe bowl. Microwave for 15-20 seconds. Zest both of your limes and then juice them (it's easier that way) and add both to the cream cheese. Add sweetened condensed milk and graham cracker crumbs and mix well. Roll into 1 inch size balls and place on a parchment or wax paper lined baking sheet. Place baking sheet in the freezer for about 30 minutes. Place white chocolate in microwave safe bowl and melt according to package instructions (all of them are different, but usually involves lower power for short amounts of time and stirring is key; you could use candy coating, which is easier when it comes to melting but the white chocolate tastes soo much better). Take a few of the truffles out of the freezer at a time. Dip them in the melted white chocolate, covering them and making sure to let the excess drip off. Sprinkle with toasted coconut, and/or more lime zest. The flavors of a coconut cream pie in cookie form. 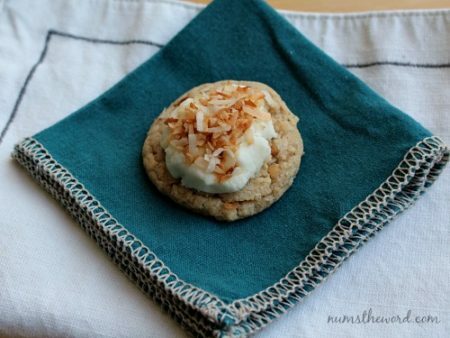 Soft cookies topped with a white chocolate coconut frosting and toasted coconut. Absolutely amazing! Here are my favorite cupcakes (right now:)! 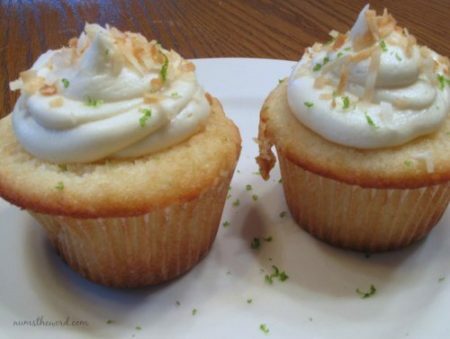 They’re a moist coconut cupcake with Key Lime White Chocolate Frosting! Some of the best flavors ever, coming together to make an awesome cupcake! Let me try that again with better English! To be honest, Leslie, these have never lasted more than a few days at our house (they get eaten in a day or two). They would need to be refrigerated because of the cream cheese, but I would think that they should be fine if kept in the fridge in an air-tight container. Hope they turn out well! Why can’t these recipes be printed. I have to hand write or type them???? Judith, To print the recipe, you simply have to click on the word print, to the right of the title over the recipe. It pulls up a page with just the recipe, ready to be printed. These sound delicious. Approximately how many pieces does this recipe make? One cup of graham crackers crumbs sounds like a lot for 4 oz. of cream cheese. Do you use a full cup? Toni, I know that I used a full cup, mostly because of the moisture from the lime juice, to make sure they stayed together. You could certainly try starting with a half cup and add as much as you want to make them the texture you’re looking for. Hi! I can’t wait to make these. One question: The recipe calls for zest from 2 limes. Do you put all the zest in the mix or leave some of that out for topping OR zest a third lime for the topping? Thx so much! does it matter what kind of limes because I am trying it with key limes and they are much smaller then regular limes. Alexander, I’m sorry! I should have been more clear in the recipe. I’ve used both limes and key limes for this recipe before and it turned out well, but you would definitely need more of those little key limes. You’re aiming for about 1/4 cup of lime juice for this recipe. Hope they turn out well!